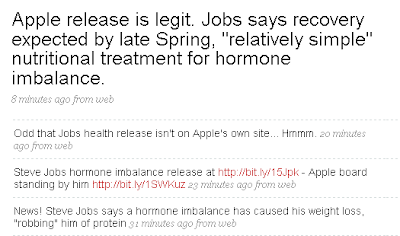 It was Twitter that first brought me the news of today's Steve Jobs' health. Credit goes to Tim Bradshaw over at the FT. I was thinking the same as Tim. Is this a real press release? You can find them here and here. There are strict rules on what a press release hub will accept as a press release. There are tone of voice, topic and presentation rules. The release needs to be a news release and not marketing guff, for example. Apple's "letter" style approach with these two press releases do not follow these rules. In most cases these rules protect the press release site themselves and ensure they stay in Google News. In other cases the press release host seeks to stay professional and present news to journalists in the usual manner. PR Newswire is big and ugly enough not to risk getting kicked out of Google News over a few 'interestingly' presented news releases but a small site puts itself at risk. In fact, even the larger PR sites would likely be cautious. I tweeted Daryl Wilcox who runs some of the most popular press response sites on the web to ask whether he would have accepted the release. The reply? "Not normally, but given it was from Mr Jobs, maybe I would. It ought to have press contact details though"
You would imagine Apple would make every effort to be cautious too. Remember to stock roller coaster after the recent false report of Jobs going to hospital? That resulted in a SEC Investigation. In fact, Apple does now have the release up on their website and this helps tremendously. I'll accept that Apple are Apple and they'll communicate in an Apple way. PR newswire can also make decisions on what press releases are suitable for publishing or not (in fact; this human made decision is what keeps a site like PR newswire interesting to bloggers and news search engines). Do you know that some magazines accept 'letters' in their 'Dear Editor' section that come from traditional PR agencies and are an alternative to the more usual offline press release? I have concerns around the ethics of that and I suspect such a tactic online would be awfully close to a paid-for-review. In today's environment of flash flood news - stories that ripple over the internet at social media speed - it can be very important to get that first wave exactly right. I very much want to see the press release sites maintaining as a high quality of contribution as possible. We're also going to see big companies struggling even more to make sure their marcoms can more quickly enough. In this case the doubt around the news was short lived. I wouldn't be at all surprised to see similar questions being asked about another high profile press release this year and for the confusion to last longer.